A Multi-Port-In node is added by default in a new Group node. Use it to add one or more input ports to the Group node so that you can process an image through the nodes in the Group node. When you plug an element to a Multi-Port-In node, an input port appears at the top of the Group node. You can add additional ports to the nodes as needed. Pass your cursor over the Group node input port to see the name of the Port Image In node that it connects to. 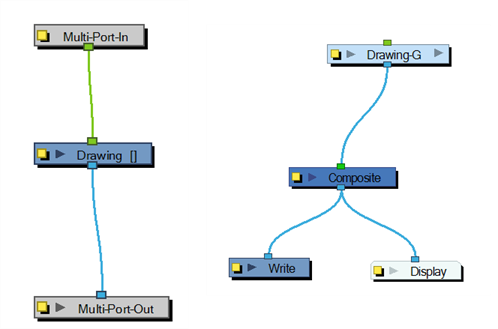 You will notice that the Group node in these examples has no output port. It requires a Multi-Port-Out node to output data from its network. Use the Multi-Port-In editor to rename the node.